Sanders, 73, is the oldest declared candidate thus far this cycle, and he's trekked a long path to his announcement: Born and raised in Brooklyn, he moved to Vermont in 1964 after college. He became mayor of Burlington, Vermont's largest city in 1981, and he held that post until 1989. He won a seat in the U.S. House of Representatives in 1990, and served in the lower chamber for a decade and a half. In 2006, he sought and won Vermont's open Senate seat, a perch he still occupies today. Sanders has visited most of the early voting states in recent months, including Vermont's neighbor, New Hampshire, as well as Iowa and South Carolina. The senator released a statement on his website early Thursday morning making his candidacy official, and he will hold a press conference Thursday unveiling his "Agenda for America." Later in the day, Clinton officially welcomed him to the race with a tweet. 1. 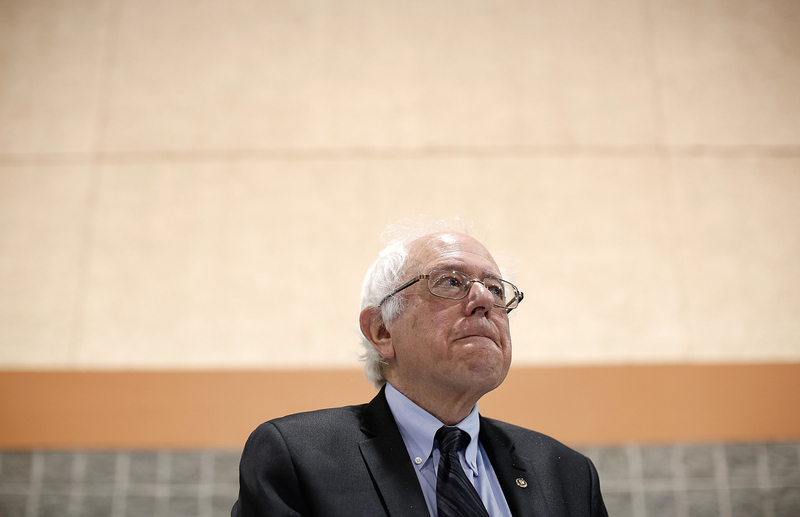 He's not officially a Democrat: Sanders caucuses with the Democrats in the Senate, and he's preparing to jump into the 2016 race as a Democrat, but he's not officially a member of the Democratic Party. Sanders identifies as a "democratic socialist," and since a 1981 bid for Burlington mayor, he has actually campaigned as an independent in his political races. He ran as an independent for the U.S. House in 1990 and won, becoming the first U.S. House member with no party affiliation since Ohio's Frazier Reams retired 40 years earlier. When he ran for the U.S. Senate in 2006, he again ran as an independent. "I am the longest serving independent in the history of the US Congress and I'm very proud of it," Sanders, who caucuses with the Democrats, told CBS News Congressional Correspondent Nancy Cordes in an interview. Still, it doesn't appear that Sanders' lack of formal affiliation with the Democratic Party would prevent him from seeking the party's nomination. A senior Democratic National Committee aide explained to CBS News that Vermont does not allow voters (or candidates) to register by party. Moreover, the aide added, DNC rules do not require a presidential candidate to register as a Democrat to run in the primary - they only require a candidate to demonstrate "a commitment to the goals and objectives of the Democratic Party." "If you're good with us, we're good with you," the aide explained. "If you can demonstrate that you share our principles, then you can legitimately be a candidate as long as you meet the other requirements. It would be hard to argue that Sanders does not adhere to the principles of the Democratic Party, considering the fact that he caucuses with them in the Senate." "The reality is that if you want to engage in debates, if you want to mobilize people, it is very hard to do it outside of the two party system," Sanders told Cordes. But he also said he has no intention of changing his affiliation in Congress to become a member of the party. "I think it makes it clear that as an Independent I worry very much that the Republican party is now moved very, very, very far to the right, and frankly that there are too many Dems who are also succumbed to corporate pressure and big money interests," he said. 2. He's trying to pull Democrats to the left: Sanders is one of the most liberal members of the U.S. Senate, and he's staked out numerous positions over the years that are considerably more progressive than those embraced by more mainstream Democrats. He was one of the founding members of the Congressional Progressive Caucus. He's warned colleagues against being too friendly to the interests of corporate America, criticizing the close ties between some Democrats and Wall Street. He supports Obamacare but would elect to go further and institute a single-payer healthcare system. He's proposed a $1 trillion infrastructure funding bill. He's called for a $15 dollar an hour minimum wage, far exceeding President Obama's proposal to hike the minimum wage to $10.10 an hour. He's proposed expanding Social Security benefits and paying for it by raising taxes. Sanders: Food stamp cuts "devastating"
Recently, Sanders has been fiercely critical of the Transpacific Trade Partnership, a massive free trade agreement involving 12 nations that's currently under negotiation. He's concerned that the agreement could undermine international labor and environmental standards. In a letter to U.S. Trade Representative Michael Froman in January, Sanders argued that corporations who stand to gain from the agreement have been involved in its development while members of Congress, and the citizens they represent, have "little or no knowledge as to what is in it." "The people who will suffer the consequences of this treaty have been shut out of this process," he wrote. "In my view, this is unacceptable." Ask him if he's too far to the left to be a viable candidate, though, and he says absolutely not. "I don't believe that," he told Cordes. "I believe the vast majority of people on issue after issue are supportive. Should we raise the minimum wage to a living wage? The American people say yes. Should we create millions of decent paying jobs in this country, rebuilding crumbling infrastructure? American people say yes. Should we overturn Citizens United and big money in politics? American people say yes. I think on all of the key issues that are out there, frankly we have a whole lot of people on our side." 3. He's a champion for veterans: Sanders was one of the architects of the bipartisan legislation that passed last summer to address problems at the Department of Veterans Affairs (VA). Lawmakers were spurred to action last year after reports of chronic treatment delays at VA facilities had been linked to the deaths of dozens of veterans. An internal audit of the department's health care facilities determined that officials had used improper scheduling practices, including the falsification of waiting lists, designed to understate the amount of time veterans had been waiting for treatment. Sen. Bernie Sanders: VA problems must "never happen again"
At the time, Sanders was the chairman of the Senate Committee on Veterans Affairs, and he championed the cause of giving the VA additional funding to hire more doctors, nurses, and medical staff. He proposed infusing the agency with $25 billion over three years. The compromise agreement he helped negotiate included $10 billion to allow veterans who are unable to receive a timely appointment within the VA system to seek care from outside providers as well as $5 billion for the VA to hire more doctors and nurses. 4. He's "not a spoiler": Sanders has been saying that if he runs for the White House, it won't be to run a "futile" campaign that he can't actually win. "If I run, I want to run to win," he has said. "I will not be a spoiler...There are ways to do this, but let me make it very clear. I will not be a spoiler and elect some Republican." Sanders has also promised he wouldn't run any negative campaign ads against Hillary Clinton. "It is not my style to trash people," he said. "It is not my style to run ugly, negative ads. Never have, never will." The senator would, however, like to have "a real serious debate" with Clinton -- "a very intelligent person who I think is interested in issues, by the way," he said. "I think we would have a debate about how you rebuild the crumbling middle class," Sanders continued. "A debate about how you reverse climate change. A debate about the foreign policy and the wisdom of the war in Iraq, and how we deal with what we deal with. A debate about trade policy. A debate about Wall Street. And that would be I think good for the American people, to be honest with you." He told Cordes that they differ on their approach to free-trade agreements -- Sanders also opposed the North American Free Trade Agreement, which Clinton championed when it passed during her husband's presidency -- and noted that he voted against the Iraq War. "The media's got to get away from personality. The question is, what we stand for, and I think the issues that I am fighting for are in fact the issues that need to be fought for," he said. 5. He's still a long-shot candidate: Although he is well known in his home state of Vermont, Sanders still has a limited national footprint. In a recent CBS News poll, 68 percent of voters said they didn't know enough about him to say whether they would consider supporting him or not. Among those who had an opinion, 14 percent said they would consider voting for him and 18 percent said they would not - the second highest percentage for a potential Democratic nominee (the highest was Joe Biden, whom 26 percent of people said they would not support). He's faring a bit better in Iowa, where just half of voters, 51 percent, say they're not sure of him. But 37 percent of voters in the state have a favorable view of him, according to a poll earlier this year by the Des Moines Register. Unfortunately, he's only the top choice of 5 percent of people who say they are likely to participate in the Democratic caucus in Iowa. Bonus Bernie Sanders fact: He has a brother in politics: Sanders' brother, Larry, is also running for office...across the Atlantic. Larry Sanders moved to Britain in 1969 and became active in politics there. He is the Green Party candidate for Parliament in Oxford West and Abingdon, challenging an incumbent from the Conservative Party, and his platform sounds notably similar to his brother's. "Labour Party and Coalition Governments have led the UK to an astonishing degree of inequality," Sanders wrote in a statement about his candidacy. "There has been a large increase in the wealth and earnings of the very rich, a sharp growth in the number of people living in poverty and increasing pressure on the Middle Classes...Only one Party, the Green Party, has policies to correct these stupidities and injustices. And, our policies are popular - once people get a chance to consider them. I want to use my role as a Parliamentary candidate to attempt to get those policies across to the largest number of people." Asked about his brother's political career Thursday, Bernie Sanders said, "I owe my brother an enormous amount." "I grew up in a family that did not have a lot of money. My dad came to this country at the age of 17, dropped out of high school, never made any money. my mother graduated high school. We didn't have a whole lot of books in the house. it was my brother who actually introduced me to a lot of my ideas," he said. "So I hope my brother does very well in his race for parliament in the U.K."